We’ve heard it said that you should “do what you love and love what you do”. After long careers of just doing, we decided it was time to start loving what we do and make a difference in our lives and in others. A friend shared with us a magazine for those interested in starting a small business and one of those was a travel agency. There was no looking back. Conlon Travel was born with over 30 years of travel planning experience visiting 39 countries and 46 states with a desire to build relationships through travel. We continually educate ourselves in the business of travel, with certifications from numerous travel associations, destinations, and travel vendors. We’ve made many new friends along the way which has been one of our greatest rewards. Naples Alumni from the Class of 2003 Class of 2004 Class of 2005 come together for the Naples American High School Bahamas Cruise Reunion 2010. The Reunion party was held in the Michelangelo’s Room Sunday Sept 5th, 2010 on the Carnival Sensation. 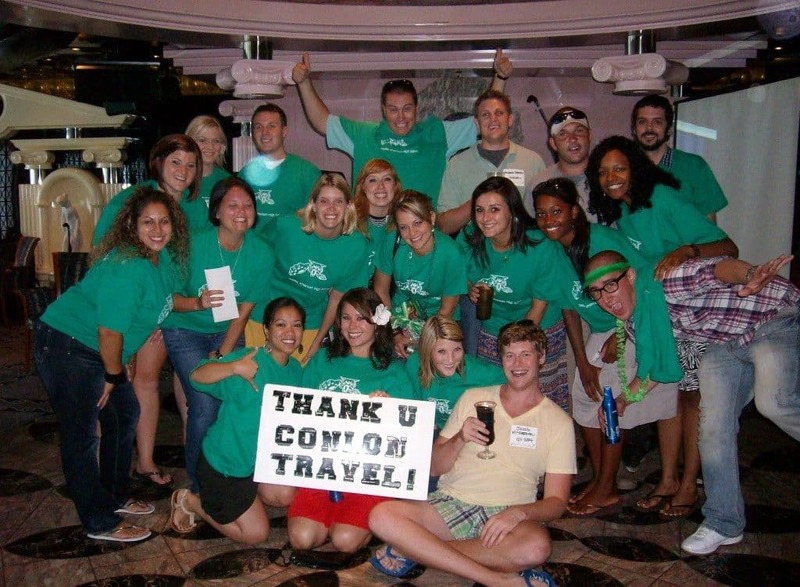 Thank you Conlon Travel for making our reunion a reality! Wendy | Careywood ID - Thank you for arranging a fantastic vacation for me. Everything flowed seamlessly! Amazing resort and great family time. You know your business and I appreciate it! David & Cecelia | Spokane, WA - THANK YOU for putting together such a wonderful trip for us to see our new great-grand baby and family in Oklahoma and a grandson and his new bride in Lincoln, Nebraska. The all expense paid trip was a Christmas gift from our son and his wife in Fresno, CA. We had a wonderful time; the hotel accommodations were superb including delicious breakfasts and they all were very friendly and eager to please. Going thru airport security was easier than we expected and the airport personnel were most helpful. Thank you again for putting it all together with such a last minute request. We would certainly recommend Conlon Travel to anyone needing travel assistance. Mark & Kathi | Davenport, WA - "Dan and Connie booked the first cruise we've ever been on---and we thoroughly enjoyed our trip to the Caribbean! We got to sit back and relax while Dan navigated through all the details. The fun of anticipating our trip worry-free was worth everything! He kept in touch through the whole process asking for our input so that we felt the cruise was tailor-made for us. What an incredible experience----made sweeter because of Dan and Connie and their expertise and love for travel! Doug & Donna | Spokane WA - Thank you Dan and Connie for your supurb service! The 'travel agency with the personal touch' is certainly true as we have booked several flights through Conlon Travel. Dan and Connie pay close attention to take care of every detail. Our daughter missed an overseas flight and Dan and Connie were with us every step of the way (very early on a Saturday morning) helping us secure another flight out that same day. They are easy to work with and are available and prepared to assist with all our flight arrangements. They love their job and it shows! Thank you guys! Audrey & Kent | Nokesville, VA - "Kent and I wanted to thank you both for an amazing trip and a lifetime of memories. It had been many years since I'd been on a cruise and his first. The trip you planned for us to the Caribbean was spectacular in so many ways. From day one, you took care of every detail and our only job was to have a good time, which we succeededin doing. It is beyond me how you were able to keep track of so many people and so many details, but you did and we thank you both. It is so refreshing to discover people that not only run a business but are also passionate about the work and people that place their trust in your hands. As always, I will continue to recommend Conlon Travel to everyone I know and you can be sure that you have a customer for life! Thank you for the trip of a life time, we can't wait for the next one! Margo | Spokane, WA - "Hello Dan and Connie, We had a wonderful trip, thanks in large part to your excellent help in planning it. Our hotel in Venice was well-located and only about a 7 minute walk from the plaza where all the public buses and water taxis go. The bridge over the canal is very big and only about 2 years old. The cruise was fantastic (of course). Very international (36 languages on-board), although overall we were told the U S visitors are down 60%. Again, we had a fantastic time and look forward to working with you again on our next trip. We head to Machu Pichu next month! Our next bigger trip will be next summer. We'll be sure to get ahold of our favorite travel agents well in advance and see what we all can come up with. Thanks for everything (the BD wish too!). What are you celebrating in 2018?